Today was a milestone, of sorts, in my life. It was eleven weeks ago today that we had Mom's funeral. 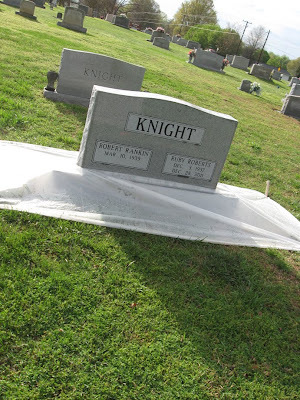 The grave marker was put in place today. The plastic covering is to protect the cement until it fully cures. It's not visible in the photo, but the base of the marker has the names of my sister and I, noting that we are Ruby and Robert's children. In the background you can also see the tombstone belonging to my grandmother and grandfather. I still haven't broken down and cried like I had expected to long before now. Was it because I was there for her at the end, as she slipped away from us? Did that make it easier to accept her passing? Or could it be that, my faith is much greater now than it has been ever before in my life? I like to believe that. That I sincerely do know that this marker, it doesn't signify Mom's final resting place at all. Mom isn't here at all. She's somewhere else, in the company of all the family that have gone on before. Waiting for us to join her. Waiting for me someday. And yet, I will probably find myself at this marker a fair number of times for the rest of my life. I can someday bring my children to it, and tell them all about the grandmother that they will not have had the pleasure of meeting yet. Once more, I have to thank the fine staff at Wilkerson Funeral Home for their exceptional service to our family, which included the very fast installation of the marker (we only ordered it last week). As surely as there is pain in this life, there is peace beyond. My condolences to you and your family.